Monday, the National Hockey League announced the three finalists for the 2013-14 James Norris Memorial Trophy, awarded to the best defenseman “who demonstrates throughout the season the greatest all-around ability”. voted upon by members of the Professional Hockey Writers’ Association at the conclusion of the regular season. 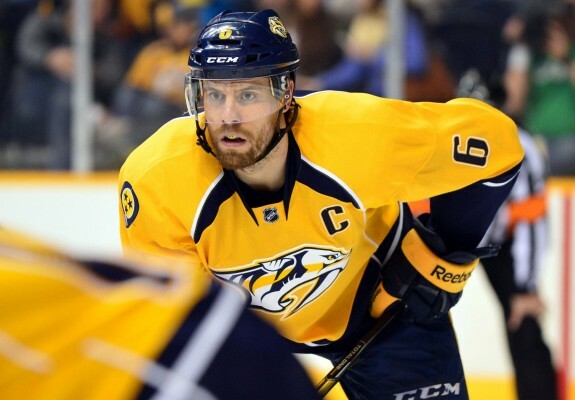 Nashville Predators captain Shea Weber was named a finalist for the third time in his career (2010-11 and 2011-12) alongside Boston Bruins captain Zdeno Chara and Chicago Blackhawks defender Duncan Keith. In the prior two years Weber was a Norris finalist, he was runner-up to Nicklas Lidstrom in ’10-’11 and Erik Karlsson (wrongly awarded) in ’11-’12. It was not a lock for Weber to win it those years — and it certainly is not a sure thing this go around. However, when is it time that the League and PHWA finally awards Weber of his high caliber play? Although Chara and Keith are both worthy candidates, here are three reasons as to why Weber should be awarded the coveted Norris Trophy. When one thinks about the name “Shea Weber”, the first thing that comes to mind is his cannon shot and aggressiveness. However, Weber was not only superb defensively, taking on opponents’ top-lines every night, he also played a big hand in Nashville’s offensive production. Weber led the team in points for the second consecutive season with 56, setting a new franchise record for a defenseman. His 23 goals were a league’s best among D-men. While Chara and Keith averaged 24:38 and 24:39 of time on ice, respectively, Weber logged an average of 26:54 through 79 games this season. The Sicamous, British Columbia native progressively became better as the season progressed, finishing the final 42 games of the season with a +11 rating. Weber was also the first player this season to have 20 goals, 150 blocked shots and 150 hits. There was no lack of responsibility in 2013-14 for Weber. The Nashville captain was named Team Canada’s assistant captain for the 2014 Sochi Olympic Winter Games. When Weber is playing well as the leader of his respective teams, they win games. The Predators were a dynamite 17-1-2 whenever Weber lit the lamp. 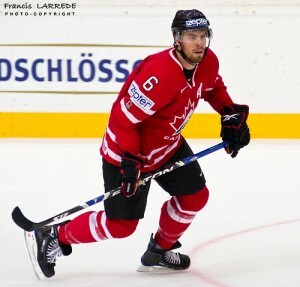 For Canada, Weber tied for second among blueliners in points (6) and goals (3), helping lead the Canada to a second consecutive gold medal in the Olympics. It was unfortunate that for the second straight year, the NHL was unable to hold an All-Star Game for the League’s best to show off their skill to entire world. While no one really cares about the game itself, many enjoy the skills competition. While Patrick Kane possesses the shootout competition, Weber’s signature competition is the hardest shot. Although Chara is still king of the hardest shot in the NHL, it is arguable that Weber has a more accurate shot with just as much power — just ask the brave few who have blocked Weber’s shot and see if they regret it immediately after. Nashville’s power play system is designed around getting Weber the puck and blasting it on net. Well, it worked as he was credited for 12 power play goals on the year. For those reasons alone is why Weber should be posing for pictures with the Norris on June 24 in Las Vegas. This award has been long-overdue for the 28-year-old and, hopefully, he will finally have his time basking in the glory this summer.